Make your way to Vigo’s Marine Station in the early evening to meet your guide, and hop on a ferry boat for the roughly 20-minute voyage across Vigo Bay. 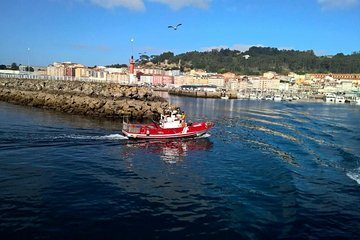 Get a new perspective on the coastal city and learn about regional history and the importance of Vigo’s fishing industry on the way to Cangas, a small bayside fishing village. When the ferry docks, catch a short taxi ride (fare included) to reach the trailhead for a scenic 2.5-mile (4-km) hike. Stop often for photos of golden-sand beaches and hidden coves that dot the rugged coastline, and soak up views of the Cies Islands Nature Park. After working up an appetite, head back into the town of Cangas for a tapas tasting at a popular local tavern. Sample four kinds of regional tapas including Tetilla cheese, fresh-caught pulpo (octopus), peppers, and fluffy fried croquetas stuffed with jamón or other fillings. To complement the savory bites, sample four types of young Galician wines like Mencia red and Albariño and Godello whites. Learn about the Galician wine industry and cuisine as you satisfy your stomach. At the end of the 5-hour tour, you can linger awhile to explore Cangas independently (please note the last ferry leaves at 10 pm) or catch the return ferry to Vigo right away for a night out in the city. For your Urban Adventures tour you will be placed in a small group of a maximum of 12 people. If there is extreme weather such as heavy rain and we cannot do the coastal trail walk, we can substitute the with a visit to the market and walk around the port – there’s always something interesting to do in Vigo! If you have any food restrictions due to allergies, diet, or for religious reasons, please advise us at the time of booking so we can make the appropriate arrangements for you.